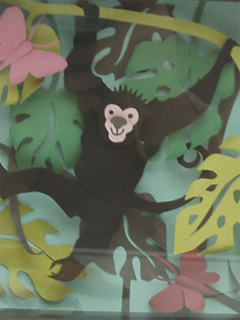 Mr Monkey examined some excellent hand-cut boxed paper sculptures by Helen Musselwhite. 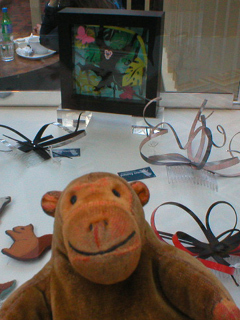 He was most impressed by the one with the monkey (obviously). 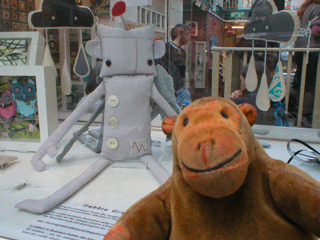 Beside another of Helen's pieces (featuring fearsome owls), Mr Monkey examined a robotington made by Debbie Greenaway. A robotington is like a robot, only more soft and cuddly. You can read about Helen Musselwhite at the Helen Musselwhite website and about Debbie Greenaway at the Imagination of Ladysnail blog.